We are heading toward an era in which users own more than one single Web-enabled device. These devices range from smart phones, tablets and personal computers to smart Web-enabled devices found in houses and cars. The access mechanisms and usage patterns of Web applications are changing accordingly, as users interact more and more with Web applications through all their devices, even if the majority of Web applications are not ready to offer a good user experience taking full advantage of multiple devices. 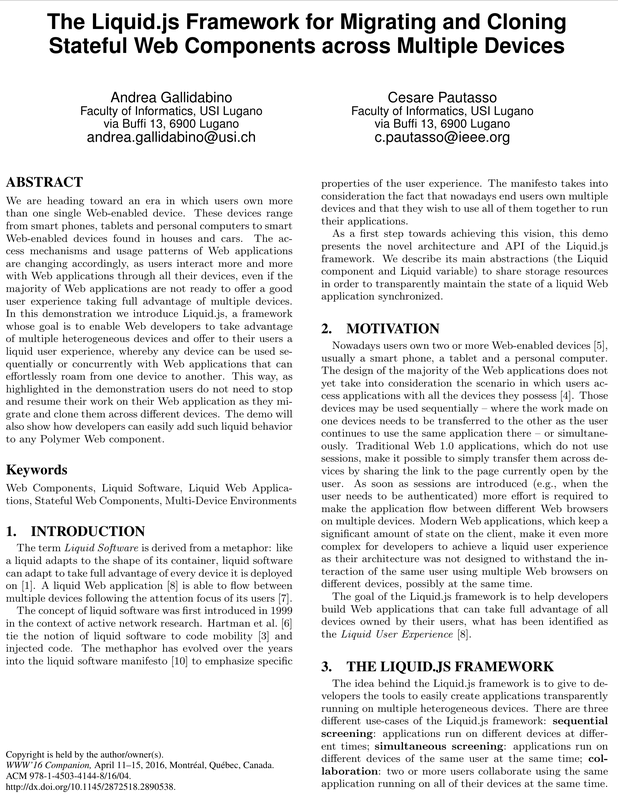 In this demonstration we introduce Liquid.js, a framework whose goal is to enable Web developers to take advantage of multiple heterogeneous devices and offer to their users a liquid user experience, whereby any device can be used sequentially or concurrently with Web applications that can effortlessly roam from one device to another. This way, as highlighted in the demonstration users do not need to stop and resume their work on their Web application as they migrate and clone them across different devices. The demo will also show how developers can easily add such liquid behavior to any Polymer Web component.